Q: The opening ceremony of China-Japan Youth Exchange Promotion Year was held in Beijing last weekend. How does China see the role youth exchange plays in China-Japan relations? Do you have plans to promote exchange between young people of the two countries? A: You may have seen that the opening ceremony of the China-Japan Youth Exchange Promotion Year was held last weekend in Beijing. State Councilor and Foreign Minister Wang Yi and Foreign Minister Taro Kono of Japan jointly attended and addressed the event. As affinity between peoples is the foundation of state-to-state relations, the tree of friendly relations between China and Japan has its roots in the friendship between our two peoples. And youth exchange is an integral part of non-governmental interactions between our two countries. The two sides have agreed to arrange for the exchange and visits of 30,000 young people in the next five years, as part of the China-Japan Youth Exchange Promotion Year activities. You may still recall the friendly get-together back in 1984, when 3,000 young people from Japan visited China, marking a highlight in our relations. It is our sincere hope that the young people will engage in a rich variety of exchange activities inspired by innovation and wisdom to get to know more about each other, deepen mutual understanding and strive to become the most active force in non-governmental exchanges between the two countries. Q: It has been reported that ROK President Moon Jae-in said on April 15 that he would like to have the fourth summit between the DPRK and the ROK without being restrained by venue and format. What is your comment? A: China always supports the north and the south in improving relations and promoting reconciliation and cooperation through dialogue and consultation. We hope that the ROK and the DPRK will continue to strengthen high-level interactions, follow through on their bilateral consensus, and play a positive role in advancing the political settlement of the Korean Peninsula issue. Q: The Vatican said yesterday that China has invited the Vatican to send a delegation and have a pavilion at the International Horticultural Exhibition which is opening at the end of this month. Can you tell us why China has decided to invite the Vatican? Is this another sign that the relations are continuing to improve? A: The Beijing International Horticultural Exhibition 2019 is an A1-class international horticultural expo. As far as I know, 110 countries and organizations will participate in this event. We hope that this Expo will commit all participants to jointly working for green development. As for your specific issue, we have learned that Cardinal Gianfranco Ravasi, President of the Pontifical Council for Culture, will attend relevant activities as the representative of the Vatican side at the invitation of the Organizing Committee of the Beijing International Horticultural Exhibition. As for China-Vatican relations, since a provisional agreement on bishop appointment was reached in September last year, the two sides have been in talks to further improve relations. 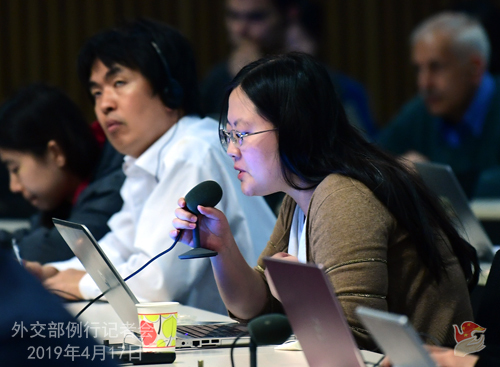 Q: Is there a connection between the reeducation centers in Xinjiang and the demolition of mosques that we have seen in other parts of the country? Does this show that China has an anti-Islam policy? A: First of all, I need to correct you on what you referred to as "reeducation camps". I am not aware of any such "camps" in China. The vocational education and training centers in Xinjiang have been set up as preventive measures with the explicit objective of counter-terrorism and deradicalization, just like what other countries have done. The measures may take different forms in different countries, but the goal is the same. On your question if China has an anti-Islam policy, I can assure you that there is no such thing. Following policies that protect freedom of religious belief, China, like other countries, administers religious affairs in accordance with law. We are resolute in rejecting and fighting religious extremism. Believers' normal religious activities are guaranteed in accordance with law and their customs respected. Today, in more than 35,000 mosques in China, over 20 million Muslims are free to practice their religion in accordance with law. We hope that the relevant media will be less enthusiastic about getting information by the grapevine. They should honor professional ethics instead of cooking up stories. Q: According to media reports, Venezuela's self-proclaimed "interim president" Juan Guaido said in his signed article on the Bloomberg website that he had established contact with China and that China understood his position. He called on China to change its stance on Venezuela and facilitate a peaceful transition. He also said he will enhance oil cooperation between China and his country and ensure the safety of investors. I wonder if you have any comment on that? A: China's position on the Venezuela situation is clear. We support the efforts made by the Venezuelan government to uphold national sovereignty, independence, stability and development. The Venezuelan affairs should be determined independently by its people. The government and the opposition need to seek a political settlement through peaceful dialogue under the framework of the Constitution as soon as possible. China will continue to make efforts to encourage talks. We hope the international community can play a constructive role to this end. The China-Venezuela relationship is normal state-to-state relations. Based on equality, mutual benefits, win-win cooperation and market principles, our law-abiding cooperation has delivered benefits to both countries and peoples. No matter how the situation in Venezuela may evolve, the Chinese side's legitimate rights and interests should be earnestly and effectively protected. Q: A transitional military council was established in Sudan recently. It has announced a two-year political transition period and promised to form a civilian government recognized by all parties, to which it will transfer power after the political transition period ends. There are also reports that the transitional military council is meeting with all parties in Sudan for discussions on forming a government. What is your comment? A: The transitional military council in Sudan has started talks with all parties in Sudan to listen to their demands. China welcomes and supports that. We hope that all relevant parties in Sudan could build up consensus, jointly move forward the political transition process, and contribute to Sudan's stability and development, which is in the interest of the Sudanese people. Q: We are now almost a little bit more than a week away before the next Belt and Road Forum. Can you now confirm with us the exact date when the Belt and Road forum is happening? And can you tell us how many countries' leaders are coming? I know it's about 40 because Yang Jiechi mentioned that in the People's Daily a few weeks ago. Do you have more exact number than that now? A: I was planning to announce the following after the questions today, but since you asked, I will bring it up here. 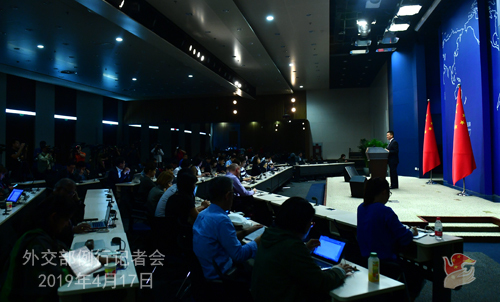 State Councilor and Foreign Minister Wang Yi will hold a press briefing on the second Belt and Road Forum for International Cooperation here at 10 a.m. Friday, April 19. He will also take questions from the press. I'm sure you will get an answer then. You are all welcome to attend the briefing. Q: According to reports, the Lima Group issued a declaration on April 15 calling on the international community to support Venezuela in its "re-establishment of democracy" efforts, and urge countries like China, Cuba, Russia and Turkey to join them while claiming those countries, by supporting the Maduro regime, have brought negative influence on Latin America. I wonder what is your response to that? A: I'd like to reiterate that regarding the Venezuela situation, China is committed to upholding the purposes and principles of the UN Charter and regional peace and stability. 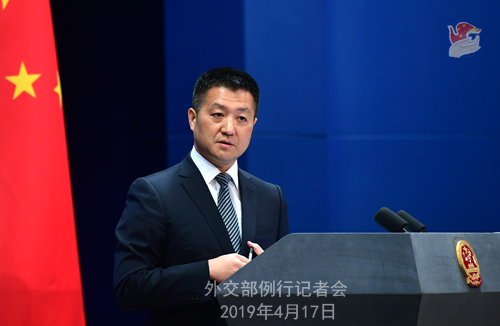 Recently, China has been keeping close communication and coordination with relevant parties on the Venezuela issue. We have been encouraging the international community including the Lima Group to, under the precondition of observing international law and the basic norms governing international relations, play a constructive role so that this issue can return to the right track of political settlement at an early date. Those claims saying China-Venezuela cooperation has brought negative influence in the region are not true. Venezuelan affairs should and can only be determined by the Venezuelan people. External sanctions and pressures will only complicate the situation or cause it to spiral out of control, threatening peace and stability in the region. We hope the relevant countries and organizations can view China's role in a correct and objective manner, see clearly who is a real friend, and do things that are genuinely conducive to Venezuela's stability, economic development and its people's well-being. Q: The second China-Arab States Forum on Reform and Development was held in Shanghai this week. Could you provide some details on that? A: The second China-Arab States Forum on Reform and Development was held on April 16 in Shanghai. Assistant Foreign Minister Chen Xiaodong attended and addressed the opening ceremony. Entrusted by the Ministry of Foreign Affairs, this forum was held by the China-Arab Research Center on Reform and Development. Those attending the forum include former Lebanese President Michel Suleiman, former Djiboutian Prime Minister Dileita Mohamed Dileita, former Egyptian Foreign Minister Nabil Fahmi, Assistant Secretary General Khalil Ibrahim Al Thawadi of the League of Arab States, and over 100 representatives and academia experts from the political, economic, cultural, media and other fields in China and Arab states. Representatives from the two sides had in-depth discussions on policy communication, deepening cooperation, exchanges between think-tanks and other topics. As Assistant Foreign Minister Chen Xiaodong noted in his speech, with a focus on the Belt and Road cooperation, China and Arab states should continue to forge synergies between strategies and actions, open wider to each other, foster innovation-driven growth drivers, deepen communication and cooperation in governance, further enrich our strategic partnership, and join hands to achieve development and revitalization through reforms. Speaking highly of the Belt and Road Initiative (BRI) proposed by China, the Arab representatives said the BRI cooperation with China brings immense opportunities to Arab countries to advance reform and accelerate growth. Arab countries are ready to strengthen the strategic partnership with China, learn from China's experience in reform and development, and deepen practical cooperation. The second Belt and Road Forum for International Cooperation will be held in Beijing soon. Many Arab states leaders will attend this forum and discuss the high-quality development of the BRI. I believe it will inject fresh and strong impetus into BRI cooperation between China and Arab states. Q: Reports say that the Japanese government has decided to send financial experts to African countries that are involved in debt issues with China to help them overcome financial difficulties. It plans to announce this move at the Tokyo International Conference on African Development this August. What is your comment? A: China has made clear its position on Africa's debt issues many times. At present, as African countries strive for faster economic and social development, the funding shortfall remains a persistent constraint. As a good brother, good friend and good partner for African countries, China, putting itself in Africa's shoes and bearing Africa's best interests in mind, would like to strengthen investment and financing cooperation with Africa and help it improve infrastructure and environment for economic and social development within its capability, thus enhancing Africa's ability to realize self-reliant growth. Facts have proven that such cooperation has brought tangible benefits to African people and is widely welcomed by African governments and people. The Chinese side has an open attitude towards and welcomes international partners stepping up cooperation with Africa. We always believe that the global partners should forge synergy on such cooperation to better help Africa's development. If Japan wishes to be of greater material assistance for African countries, including in investment and financing, China would be glad to see that happen. However, if it is just trying to make an issue of Africa's debt issue to damage China's image out of political calculations, then I don't believe African countries will endorse that. 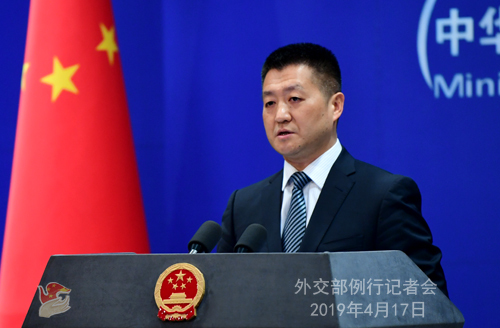 Q: A fortnight ago China said it had made some positive progress at the listing of Pakistan-based terrorist Masood Azhar. Can you tell us if any further progress has been made on this issue? It's reported that the US, the UK and France have once again urged China to lift the technical hold on the resolution seeking to ban Azhar at the UN 1267 Committee. Is it true? Will China support such a resolution at the UNSC if the US proposed this resolution to the Security Council and bypasses 1267 Committee, is China ready to give explanation if there is a public debate on this? A: China's position on the Masood designation issue is consistent and clear. Recently China has been in communication with relevant countries and things are moving towards settlement. As to relevant countries' attempt to force a new resolution at the Security Council, China has repeatedly stated its opposition. I can reiterate our firm opposition here. As a matter of fact, in relevant discussions at the Security Council, the majority of the membership has made it clear that the issue should rightly be resolved within the framework of the 1267 Committee instead of the Security Council. We urge relevant countries to respect this view, continue to meet each other half way with a cooperative attitude and work together for a proper settlement of this issue in the 1267 Committee. Follow-up: It's also reported that China has been given a deadline for April 23 and if it does not lift the technical hold by April 23 then they would finally go to the Security Council. Can you confirm that? A: I don't know what is your source of information. There are explicit rules of procedure and disciplinary regulations when it comes to the Security Council and its subsidiary bodies. I am afraid you will need to seek confirmation with your source. China's stance on this issue is very clear. It must be resolved in a cooperative manner by Security Council members in the 1267 Committee. We don't believe forcing a proposal that lacks consensus will lead to the intended effect. Q: A fire broke out at dusk on April 15 local time in the Notre Dame de Paris Cathedral, causing damage to much of the roof and the collapse of the spire. Has China expressed condolences to the French side? A: The Notre Dame Cathedral is not only a symbol of the French and European civilization, but also an invaluable cultural heritage of all mankind. Yesterday, President Xi Jinping sent a condolence message to French President Emmanuel Macron upon learning the sad news to express sincere condolences to all French people. Chinese social media platforms such as Weibo and Wechat are flooded with heartfelt lamentations over this tragic incident. It shows that appreciation of culture and love for beauty transcends all borders. Just as President Xi wrote in the condolence message, it is our sincere hope that with the efforts of the French people and the support of the international community, Notre Dame will be restored to its former glory. Q: Regarding this Masood Azhar issue, you just said it is moving towards settlement. Can you please elaborate you have a timeline or are you in touch with parties? Is there a kind of formula you are working on for the solution of this? A: First, you correctly quoted me as saying that things are moving towards settlement, which is true. Second, on ongoing discussions at the 1267 Committee, just as I said, there are explicit rules of procedure and disciplinary regulations when it comes to the internal consultations at the Security Council and its subsidiary bodies. As a member of the Security Council, China should abide by the rules and regulations faithfully. The following question was raised after the press conference: media reports say the US has recently approved a package of arms sales worth 500 million US dollars for Taiwan, which includes fighter jets pilot training and maintenance services. I wonder if you have any comment? A: The US arms sales to Taiwan constitutes a serious violation of the three China-US joint communiques, in particular the August 17 communique. It is interference in China's internal affairs and infringement upon China's sovereignty and security interests. China firmly opposes it and has lodged solemn representations to the US side. I must emphasize that the Taiwan question concerns China's sovereignty, territorial integrity and core interests. We urge the US to honor its commitment to the one-China principle and the three China-US joint communiques, cancel this planned arms sales to Taiwan, stop selling arms to and military ties with Taiwan before serious damage is caused in our bilateral cooperation in important areas and the peace and stability across the Taiwan Strait.